Can you speak English? Can you buy a round-trip plane ticket to Spain? That’s all you need to qualify to spend a free week in Spain, courtesy of Vaughn Village and its English Town English immersion program. The only requirement: You need to be willing to speak English for 14 hours a day with enthusiastic Spaniards. Here’s how the program works: 20 Spaniards who want to improve their conversational English pay to spend a week fully immersed in talking with 20 native English speakers from around the world. The native English speakers simply need to pay their roundtrip airfare to Madrid. All meals, lodging and other travel expenses are then covered by Vaughan Village. Participating in this English-immersion program is an ideal experience for parents and teens. My husband and I spent a week in Valdelavilla, Spain, an 18th century village with authentic cobblestone streets and stone houses. The last sheepherders left the isolated town in the early 1960s. It sat deserted and quiet until a Savings and Loan Association took over and brought the village to authentic modern day charm. The rooms were immaculate, with food prepared by Basque chefs. As an extra bonus, the village is situated next to Europe’s largest vulture colony. At any time, ominous looking black birds swooped overhead, prompting plenty of conversation. And conversation is what it is all about. I tried to explain America’s obsession with fast food devoured while on the road. My husband Allan pantomimed driving up to a McDonald’s Drive-Through window. He took everyone’s orders and then pretended to eat burgers, fries and shakes in the car…crumbs and all. The Spanish mother looked shocked and confused; telling us her children had never eaten in a car. Explaining American culture to a Spaniard is just part of the daily routine at English Town. Part of the day is spent rotating with one-on-one sessions with the Spaniards. Our group consisted of a lively mix of teachers, 3 Ph.D’s, and business people. Spanish executives from Microsoft, BMW, and Deloitte and Accenture frequently attend as a crash course in improving their English. At the beginning of the week, the Spaniards are a bit hesitant to use their English. By the end of Day 3, the conversation level at dinner reached a crescendo as English and Spanish speakers talked and laughed as if life-long friends. Poor Maria Delores and the rest of her Spanish counterparts. Not only did they find themselves doing teambuilding activities, they made balloon animals, dressed up in crazy costumes to present infomercials and sang silly camp songs. We found out more about each other’s culture than any month-long organized tour could provide. As we got to know each Spaniard on a personal basis, e-mail addresses were exchanged, as well as personal invitations to visit their homes. By last count, my husband and I have open invitations to visit our new friends in Barcelona, Seville, Toledo and tiny villages off the tourist radar. They, of course, are most welcome to visit us when they get to the Bellingham, Washington, area. English speaking volunteers select from several locations throughout Spain. Gredos, Avila, is a four-star hotel close to the Gredos mountain range. Some volunteers prefer La Albera, Salamanca, where participants stay in a four star hotel with mountain views. Location isn’t as important as what takes place around the lunch table or on casual walks through the country side. I learned to enjoy stewed tomatoes on toast for breakfast while the Spaniards learned Americans don’t spend a leisurely two hours eating dinner every night. An added benefit of the program is a similar camp for teens. (Also free!) Our daughter Sondra spent a week in a location several hours south of us, speaking English with 20 Spanish teens. Instead of one-on-one sessions, the teens swam, played volleyball and put on skits. During a casual conversation with several teens, Sondra found out they didn’t know what cookies were. “Let’s bake cookies!” she suggested and the Spaniards followed her into the kitchen. Our daughter, in true American fashion, showed the Spanish teens the art of eating raw cookie dough as well. Those corrupted teenagers are probably eating cookie dough in the back seat of their parents’ car this very minute! She still e-mails the Anglo friends she made from Australia, England and Ireland, as well as her Spanish friends. Afterwards Allan, Sondra and I spent another week exploring France. 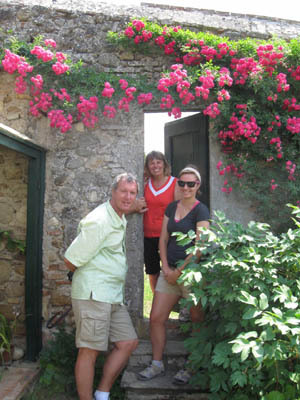 Vaughan Village proved to be a perfect, low-cost component of a two-week European vacation. We may not have visited all the tourist attractions of Spain, but we gained an insight into Spanish customs, traditions and made international friends. Sounds like a fun program, Silvana. I guess some questions are perennial favorites – I usd to get that question about American garage sales when I lived in Madrid. That’s amazing! What an incredible opportunity. What a great culturally-rich experience for both sides of the participants. Thanks for sharing…I can’t wait to share this with some friends with older children! This sounds amazing!!! What if you went as a family, would they put you all up as long as one adult was doing the program? I did this same program with Vaughantown and it was very interesting and I made a lot of great memories and friends….I highly recommend it!!! I speak English very fluently, but I am not American Native Speaker, my first language is Chinese. I don’t know if I can teach English in Spain.